Even on a fast-paced elimination episode of "The Voice," which lost eight of its 20 contestants, host Carson Daly still had a few moments to spare for another member of the NBC family. 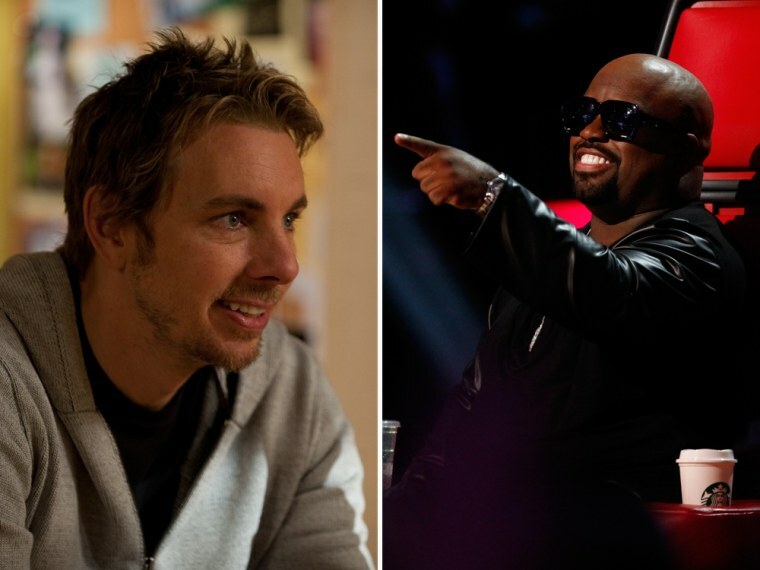 Dax Shepard of "Parenthood" stopped by to say hello — and dish about CeeLo Green, the "Voice" coach who's been a guest star on the show. The actor, who just weeks ago wed Kristen Bell — the mother of his 7-month-old daughter — reported that CeeLo's team visited the "Parenthood" set, rehearsed and took a picture at the show's Luncheonette recording studio. How did Shepard ID the visiting "Voice" contestants? "I immediately knew it was [CeeLo's] team because it was four super-hot chicks — and a dude he definitely thought was a chick," he said. That "dude" was long-haired Jonny Gray, who — as Carson pointed out — had just found out he made it into the top 12. Shepard also aired some of CeeLo's dirty laundry. "The funny thing about CeeLo is he came to 'Parenthood' with his own hair person. It's like me having a horse trainer," Shepard said with a huge grin. "I don't have a horse." Which leads to the obvious question: Is there a better job in the world than being CeeLo's hair person, being as he has none? What exactly does that person do? All CeeLo could do was laugh. It was a rare moment of levity on a night where each coach expressed their sadness at having to send two people home. Blake Shelton, for example, told Shelbie Z. on Monday that if he'd been in a coma, woke up and saw her sing, "I'd think that was one of the biggest stars in country music." But on Thursday, he picked Ray Boudreaux over her and Nic Hawk after the audience saved Austin Jenckes and Cole Vosbury instead. Maybe he was just afraid that picking her would make for too much competition at next year's Country Music Awards? CeeLo, Christina Aguilera and Adam Levine all said that they'd continue to be there for their eliminated contestants regardless of the results. That might be some consolation down the road for Tamara Chauniece, Amber Nicole, Olivia Henken, Stephanie Anne Johnson, Preston Pohl and Grey, but there was no love shown to any of them from either the voters or their coaches on Thursday. All were sent home, as the remaining 12 took a moment to bask in their good fortune —and then immediately began thinking about what to sing next week.